Konami, Konami...you have to try harder than this. With one major publisher already in and another getting ready to storm the rhythm band genre with drum sets that look like...well, drum sets, the best you can come up with is a rubber set with oddly shaped heads that resemble the old board game Perfection? The saddest thing about Rock Revolution is that if it had come out before the likes of Rock Band I would have absolutely loved it. Unfortunately the game company that pioneered the plastic instrument video game instead comes off like a second-hand copy. The really sad part? I love the feel of these ugly drums. I found the response of the sticks off the rubbery heads extremely satisfying as I stumbled my way through Blink 182's "All The Small Things". It's just that the drum placement doesn't make much sense with the way the heads are presented, along with the fact that I already have the song - one of a handful available to demo - in Rock Band. The Rock Revolution drums do a lot of things right. The springy feel, the fact that you can store the sticks in two holes in the base, and the sheer number of drums - six plus a pedal - would have presented a pretty attractive package two years ago. 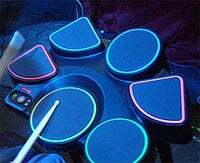 Now we have Rock Band 2 coming out with a drum set you can hook up a device to in order to make it a real electronic drum kit, Guitar Hero World Tour with it's stylized cymbals and music studio...or you can choose Konami's blocky rubber monstrosity. The choice seems pretty clear.